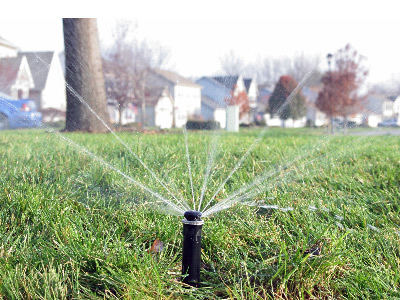 A very large percentage of irrigation systems have spray head zones somewhere in the yard. These are the little heads which spray what looks like a mist when the zone comes on. These heads are used in small or narrow spaces where large rotors are too big. One of the problems of the traditional spray head is their extremely high precipitation rate. They actually put the water down faster than most soils can absorb it. If the water is being put down faster than the ground can take it then the water starts moving around on the surface ending up in places other than where you had intended (ie. The driveway or street gutters). The second big problem of the spray head is the uniformity of distribution. Spray heads have the worst distribution uniformity of all sprinkler heads manufactured today. Apparently there are certain limitations to the nozzles which no manufacturer has been able to overcome. This poor distribution adds to the wastefulness of these zones in your yard. Recently a new head type has become available, the stream rotor. These heads have radius as short as 8’, precipitation rates equal to the large rotor heads and distribution uniformities equal to and better than large turf rotors. Now we don’t have to worry about the problem of watering faster than the ground can take it which means all of the water gets into the soil. And with distribution uniformities so high we don’t end up with wet and dry areas. Studies have shown that when the nozzles of a spray zone are changed to stream rotors, the zone uses 30% less water and the landscape is actually healthier. Some cities such as Sonoma California are so impressed with these heads that they have a rebate program for people who make the switch. By the way, we don’t have to change the entire head, just the nozzle making for a quick service call. If you have a zone of spray heads which isn’t quite popping up all the way or the heads aren’t spraying as far as they used to or as far as they are supposed to, switching to stream rotors can solve the problem. Since these nozzles require less water for the same coverage area, the pressure losses for the zone go down. This in turn means that there is more pressure remaining for the heads to get all the way up and throw the water as far as they were supposed to. Some of our customers (who were not installed by us) have systems where large rotors and spray heads are mixed on the same zone. This is an extremely big waste of water and unhealthy for the turf being watered by the spray heads. The reason is that the spray heads have a precipitation rate 4 times greater than the rotors so the turf being watered by the spray heads is getting 4 times more water. The introduction of the stream rotor is the savior of these systems. The stream rotor has the same precipitation as the large rotor and can cover the smaller areas that the spray heads were watering. In conclusion, there are many woes that the stream rotor can solve. If you think that you might have one of these problems, give us a call and we’ll see if we can help. The Metropolitan Water District of Southern California is currently paying residents $4.00 per head that get changed to STREAM ROTORS.